the sucking type (D) of a female mosquito. 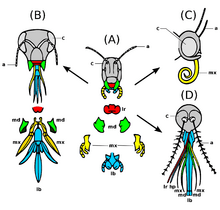 Mouthparts is a general term used in animal biology (zoology). It means the various bits and pieces around the opening of the alimentary canal (mouth). These mouthparts are used by animals to help get their food organised before they swallow it. Mouthparts Facts for Kids. Kiddle Encyclopedia.